Kelly Greenberg, who is in the final year of a contract extension, has been accused by players in the past of mistreatment. 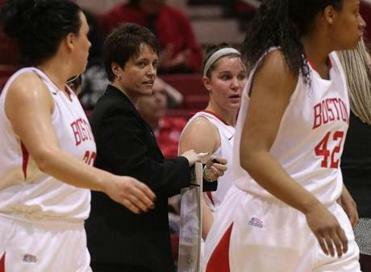 One basketball player at Boston University said she felt so emotionally damaged by her coach she considered suicide. Another player said the coach, Kelly Greenberg, treated her so poorly she sought mental health care. And two other players said Greenberg’s emotional abuse ruined their love of the sport. 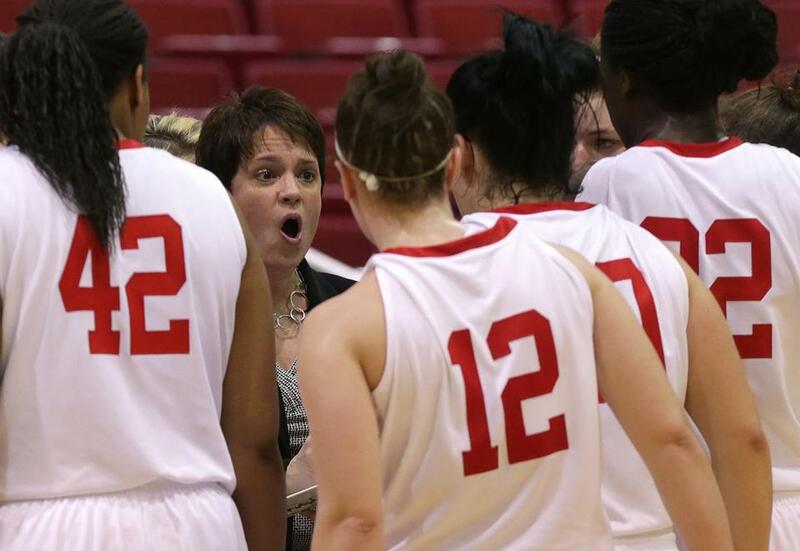 All four women walked away from the BU women’s basketball team this academic year, an exodus that has renewed questions about Greenberg’s treatment of her student-athletes — and her future at the school. BU has launched an evaluation of Greenberg’s coaching performance, including an inquiry into the allegations of emotional abuse, according to a school official. All four women were attending BU on $60,000-a-year athletic scholarships. Nearly 30 demonstrators gathered Saturday in support of Kelly Greenberg, the target of new claims of emotional abuse. “We have been made aware of issues and concerns about Coach Greenberg, and we’re taking a very serious look at them from both inside and outside of athletics,’’ BU spokesman Colin Riley said. Greenberg faced similar complaints seven years ago, when most of her players reported to BU’s athletic director that Greenberg routinely engaged in unwarranted and damaging personal attacks against them. Of the four players who recently left the team, two walked away from their scholarships, another is scheduled to graduate in May, and the fourth remains in school, her financial status to be determined. Greenberg, who completed her 10th season as BU’s head coach Thursday, declined through a school spokesman to be interviewed. She is in the final year of a contract extension she received after guiding the Terriers to a 25-8 record in the 2008-09 season. The other departed players — Melissa Gallo, Katie Poppe, and Dionna Joynes — said they experienced varying degrees of emotional abuse from Greenberg. Greenberg finished the season with a depleted roster of only nine players after the departures. The team posted a record of 13-20, Greenberg’s worst at BU. Riley declined to comment on her future at the school. Greenberg, 46, has been credited with positively influencing many players through the years. She has been praised by leaders at the University of Pennsylvania, where she guided the Quakers to two Ivy League titles as head coach from 1999-2004, and Holy Cross, where she served for seven years, finishing as the associate head coach. A couple of Greenberg’s top players this year also were said to support her, but the school declined to make them available for interviews. Personality clashes between coaches and players are not uncommon. But the players who left the team this year echoed complaints that Greenberg had previously faced at BU. In 2008, Greenberg became the subject of a Globe story after two scholarship players — Jacy Schulz and Brianne Ozimok — walked off, saying they no longer could tolerate her mistreatment. The players who left the program this year said they were not aware of the Globe report before they committed to BU. In separate interviews, they said they recognize the difference between a constructively aggressive coach and a bully. They described Greenberg as the latter. Two of the women — Joynes and Theobald — said they had experienced emotional challenges in high school but none related to their coaches and none as serious as the problems they allege Greenberg caused. They said they sought mental health care at BU because of her. “She didn’t treat us like human beings at all,’’ Theobald said. The four women said it was not uncommon for Greenberg to assail them as “horrible’’ and unworthy teammates, especially when they were injured. Joynes said she reported feeling suicidal after Greenberg described her as an uncaring and selfish teammate after she suffered a concussion. She said she reported her suicidal thoughts to a BU staffer and was rushed by ambulance to a hospital. Only two players who left the team — Gallo and Poppe — were consistent contributors on the court. Theobald and Joynes were entering their sophomore years and had been expected to play more prominent roles in the coming years. Gallo, like the others who left the team, stressed that she loved everything about BU but Greenberg. Poppe, a sophomore guard who starred in the New York City area before she arrived at BU, started 10 games for the Terriers and appeared in 16 before she parted ways with Greenberg with two weeks remaining in the regular season. Poppe’s teammates said her relationship with Greenberg turned bad after Poppe suffered hand and ankle injuries. Poppe said in an interview that she left the team because she felt emotionally abused by Greenberg, but she declined to comment further because she wants to stay at BU and does not want to be seen as criticizing the school. As for the other women, Gallo plans to graduate in May and enter the hospitality industry. Joynes, the first member of her family to attend college, said she is researching schools and financial aid and hopes to transfer in the fall. Theobald, too, plans to transfer, but not to play basketball.